Taka Bonerate. My friend once told me how beautiful this place is. I still remember reading his long email describing this place which is only a boat ride away from his hometown. However, that time I didn’t really keep that place in mind because even to mention the name, Taka Bonerate, I had had a little hard time to do, furthermore, to remember. Until last year, when I opened up a map to do some research and plan out the itinerary for IDE next trip, I stumbled upon a group of small islands further south of Bira in South Sulawesi. It reminded me of this place and what my friend said. I thought since we would be going to South Sulawesi, why not we add few days to explore that national park altogether. So, from the initial plan to spend only seven days in South Sulawesi, I extended to nine days in total. I rearranged the itinerary and included Taka Bonerate in the first part of our South Sulawesi trip before finally heading to Toraja Land for the closure. What Must You Know Before Going to Taka Bonerate? What to Do in Taka Bonerate? There are many flights departing from Jakarta to Makassar, from budget to full-board airlines, daily. We won’t likely get any flight issue to get here. For this leg, we have two options. One, to go by land from Makassar Airport to Tanjung Bira which takes about 4 hours. Then, continue with taking a public ferry ship across to Pamatata Selayar Harbour on Selayar Island which takes about another 2 hours. 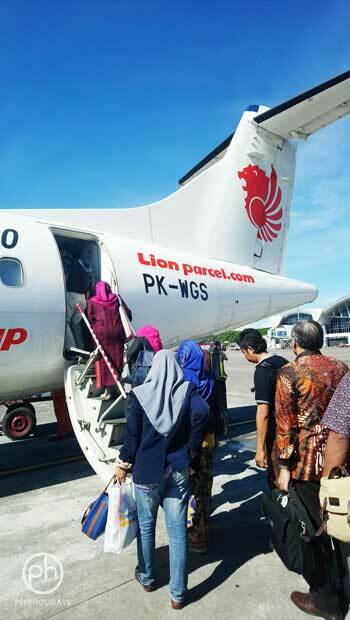 Two, is by taking 30 minutes short domestic flight from Makassar to Selayar Island which is obviously much faster but may not be cost-effective for people with tight budget. Currently, there is only one morning flight at 8.55 am by Wings Air that fly to Selayar Island from Makassar. So, if you plan to get to Selayar Island by air, do plan carefully. I usually use Traveloka to search for all my flights and in fact, I booked all the flights for this trip through there. I can say it is my most favourite platform to use because of the clean interface, the filter and sorting features, that make my planning easier. Besides that, it clearly states what amenities or benefits I will get from the airlines for every booking I am about to make and also the transit time whenever applicable. Plus, there is a various method of payment available which make the booking process even faster. And, IF, we need to request a refund because of flight cancellation or due to other reasons, it can be done easily through our Traveloka account, too. This is the last leg and also the most challenging part of the journey. I say so because after we reach Selayar Island, we still have to take another one to two hours car ride to Pattumbukan Harbour where all boats to Taka Bonerate depart. I was told by my local guide that there are only three medium-size public boats heading to Taka Bonerate. The boat is big enough for 15 people to board with all belonging and necessities for the trip. And that’s not all. A four to five hours boat ride to get to Rajuni or Tinabo Island in Taka Bonerate is waiting for us ahead. As we will sail through the open sea, weather does really play an important part of the journey. So, going to Taka Bonerate during recommended months – late March to November, is always advisable. Also, because of the long journey, it will be good to wear comfortable clothing and bring some books or snacks to kill the time. Make yourself as comfortable as possible. If you have sensitive ears, do bring earbuds as the boat engine can be too loud sometimes. You know, we are not on a cruise ship. The boat itself has two decks – upper deck and lower deck. All of us spent most of the times on the upper deck, relaxing and enjoying the view, laying on the mat – making up some sleep we lost last night because of the midnight flight we took to Makassar. While for me, I was on and off chit-chatting with others and gazing at the sea. Since there is no internet connection, there is really no excuse not to talk to people face to face although I have to shout a little fighting with the loud noise of the engine. Have I told you that Taka Bonerate has the 3rd largest atoll in the world? I didn’t exactly understand how massive it is before I get there. But in here, we sure spend a lot of times snorkelling and island-hopping. If you dive, there are many dive spots you can go for, too. 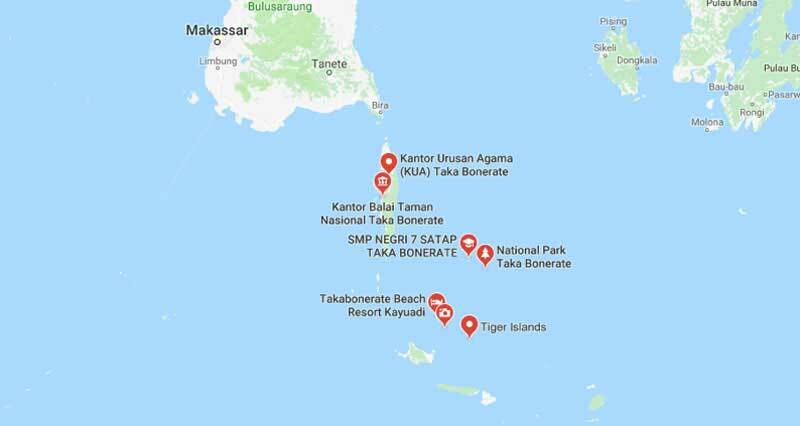 But because there is not dive centre in Taka Bonerate, so, if you plan to dive, remember to do all your diving arrangement in advance or when you are on Selayar Island. In total, we have three days in Taka Bonerate. However, the first and the last day practically we spent most of the time travelling back and forth from Selayar to Taka Bonerate. So, in actual, we only have less than two days. If we plan well, that two days is enough to make us leaving Taka Bonerate in awe and craving for more days the next time we come. We went to five different spots around Taka Bonerate and each spot is worth to get ourselves wet. We started to snorkel at one point and our boat picked us up from another point about 40 minutes later which means there are just so many things to see. We swam, we snorkelled and enjoyed watching the long stretch of lively and colourful corals along the way. If we were not limited by the time, I would have snorkelled slower and longer. I saw fish I have never seen before, a giant clamp, moray eel, and also lobster. I saw corals in various shapes and sizes – from soft to hard corals; from small to a size that I need to swim around it just to see the whole thing. It has its own excitement seeing such beautiful and healthy coral reef especially in a big number like this and what brought me more excited was the water was so clear. Every spot we went, we had this quality of visibility. The state government work hard to protect the marine life as I heard some areas had been damaged by bomb fishings. Bomb fishing not only destroyed the corals but also the habitats. The villagers staying near to the damaged area have a difficulty to find fish because of it. Homes for the fish are no longer there, why would the fish come back, I think. Nevertheless, I saw baby corals are being planted as one of the efforts from the National Park to regrow and conserve. There are also restricted areas where no activities in any form are allowed. This place is just so precious. No wonder our guides keep reminding us not to touch or step on the corals. Oh, you may want to know why I finally decided to dive with Livingseas. Taka Bonerate National Park is a group of islands. There are two islands that are more visitor-friendly in Taka Bonerate – Rajuni and Tinabo Island. There are no hotels or resorts available on both islands, only homestays. We stayed one night in Rajuni Island which is more populated and has more choices of homestay, and one night in Tinabo where there is apparently only one homestay available on the island. Staying on Tinabo Island feels like staying on a private island. No people stay on the island except those who work there. We don’t see many people around and houses except the homestay, the administration office, and few gazebos in Tinabo. People usually visit this island during daytime and go back to their home on another island in the afternoon or late afternoon. Meanwhile, on Rajuni Island which is only about an hour away, is different. We can see children playing around, people doing their daily activities, more houses, small shops, and there is one school on the island. I was still thinking whether the place is really as spectacular and as great as what my friend and some online media reported when we were on the boat heading to Taka Bonerate. I was hopeful that Taka Bonerate won’t disappoint us after such a long journey. I have been to few places that many people said to be the most beautiful for its underwater. But in here, while the typography and the underwater world are quite not the same, it still offers a unique experience itself which I don’t remember I have ever seen in other places around Indonesia. If you really love underwater, this is the place you should really go. As for me, I totally love it and I dare to say it is worth the long journey. Now I understand, why they say Taka Bonerate has the 3rd largest atoll in the world and I can see how big deal it actually is. If you are longing for a break from the hustle and bustle of your daily life and you don’t mind staying in a homestay with limited facilities and a little longer journey, then I can’t wait to recommend you to go to Taka Bonerate! Have you heard about this place before? What do you think about the travel times needed just to get there? Will that turn you off? Spill!